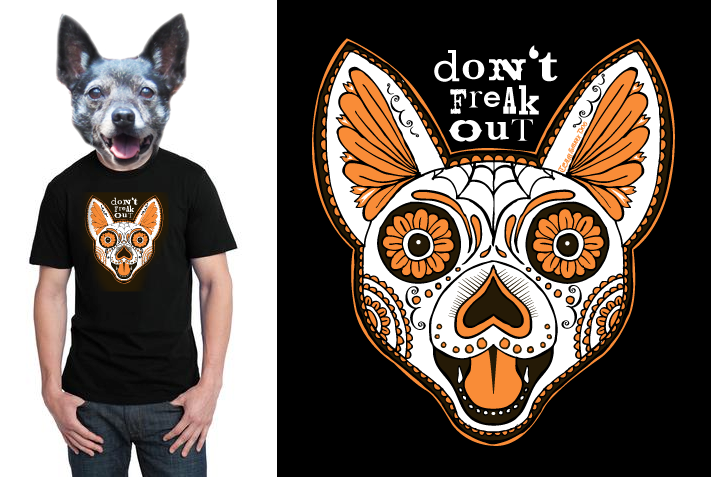 team small dog: doN't Freak Out-a shirt you can buy! 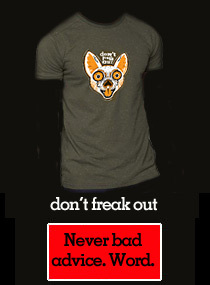 doN't Freak Out-a shirt you can buy! Very good advice from our friend Otterpop. Oh wait. Very good advice I give to our friend, Otterpop. All the time. Awesome advice for if you are training dogs! Or puppies! Or competing at USDAA World Cynosport Games in October in Morgan Hill, California! Now you can have good advice too, featuring a spooky dia de los muertos Otterpop skull face. Pre-order NOW BY WEDNESDAY SEPT. 24 for the Low Low Low Low price of $20+shipping and handling. Shipping and handling is $5 continental usa, MORE to other places. Hint Hint Hint. If you are coming to Cynosport Games in Morgan Hill, you can pick it up from me there outta the back of my car and pay ZERO shipping and handling! So twenty big ones gets you a shirt in that case. AFTER Wednesday Sept. 24 price skyrockets to $24+shipping and handling. Shipping and handling is still $5 continental usa, MORE to other places. You can still pick up at Cynosport Games or if you see me at the grocery store or whatever for zero shipping and handling. But there will be limited amounts! No guarantees of sizes or availability after this! Hint Hint Hint you shoulda pre-ordered early! All shirts that get shipped will ship in October. All payments via paypal or cold hard cash slapped in my hand. All pre-orders gotta paypal. Shirts are District Young Mens Concert t's. 4.3 ounce soft spun 100% cotton. Black only. Runs sort of smallish, beware if you don't like a little smallish and get a size up maybe. To order just send an email to timmy at plasticdisaster dot com. Operators are standing by. I don’t actually know how to react to your post because I do know that no words can help you feel well again.